July 22, 2010- At 17:44 Station 1 was dispatched for Ladder 725 to assist Auburn, Landingville, Deer Lake and Orwigsburg Fire Departments on a possible house fire at 403 Lake Front Drive, West Brunswick Twp. But before the ladder could go en-route, they were canceled off by incident command. July 21, 2010- At 19:28 stations 1 & 2 were dispatched to assist Chief 722 (Sattizahn) on a tree down near 131 Willow Street, Schuylkill Haven Boro (Willow Street Playground). Once apparatus arrived on scene they were sent to the roof of the pavilion to cut and remove a tree that had fallen on it. Time out was 25 minutes. July 21, 2010- At 19:04 stations 2 & 4 were dispatched to the area of 760 Schuylkill Mountain, South Manheim Twp, for a tree down on the roadway. However, before any apparatus could arrive on scene, the tree was removed from the road by another motorist. Time out was about 5 minutes. July 18, 2010- At 12:14 the Rainbow Hose was dispatched for Ladder 725 to assist districts 56, 42 and 47 (Orwigsburg, Deer Lake and Landingville) on a possible apartment building fire at 635 West Cherry Street, Orwigsburg Boro. The first arriving chief (56-02- Fessler) got on scene with nothing showing from the exterior. After a brief investigation, he found that the fire was out but there was still smoke in the building. As everything was going on, it was also found that one of the residents was burned by the grease fire and the Medics already on scene requested to fly the victim. Chief Fessler held the units that were already on location, and diverted the apparatus still on their way to the Blue Mountain High School to set up an LZ for the injured patient. 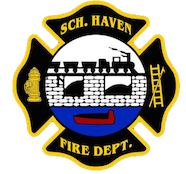 July 17, 2010- At 13:07 the SHFD was dispatched to 252 Dock Street, Schuylkill Haven Boro, at the Jerusalem Lutheran Church, for an automatic fire alarm. As all units arrived on scene, they were divided up by incident command, Chief 730 (Reed) and conducted an investigation. After a few minutes, it was found to be a faulty alarm, and all units were placed available. July 17, 2010- At 10:43 the Liberty Fire Company was dispatched at the request of Chief 723 (Donatti) to assist him at 539 Holiday Drive (Holiday Village/Schuylkill Haven) for an odor investigation. As Engine 737 went en-route, they were advised from SCCC of a possible ODOR of carbon monoxide. The crew from engine did a sweep of the residence with “the sniffer” and found everything to be within the normal limits. Time out was about 20 minutes. July 10, 2010 – At 19:08 Stations 1 & 2 were dispatched to the area of 6 East Main Street for a reported vehicle accident with injuries and fluids down. Chief 730 (Reed) arrived on location and was met with a two vehicle accident with injuries and fluids down. Crews quickly arrived on scene and applied floor dry to the area around the vehicles and cleaned the debris from the roadway. Personnel also assisted with traffic control while a local EMT and EMS assisted the patient. Chief 730 had command and units were on scene for approximately 30 minutes until the towing company arrived. July 10, 2010 – At 13:05 Stations 2 & 4 were dispatched to the area of 1800 Long Run Road for a possible brush fire. However, before any Haven units could go responding, county received a second call back advising of a controlled burn. All fire units then canceled their response. July 10, 2010 – At 8:17 Station 4 was dispatched along with District 47 (Landingville) and District 56 (Orwigsburg) to 29 Miller Lane, South Manheim Township for a residential fire alarm. Chief 47 (Hoffman) advised the alarm to be a false activation and canceled all responding units.